Gunmen launched an attack Monday evening on the European Union military training mission’s headquarters in the Malian capital, Bamako, in what appeared to be the latest in a series of attacks on Western interests in the region. Armed forces killed at least one man, who lay outside the hotel in jeans and a shirt in a pool of blood next to a Kalashnikov rifle. His backpack lay beside him. Cmdr. 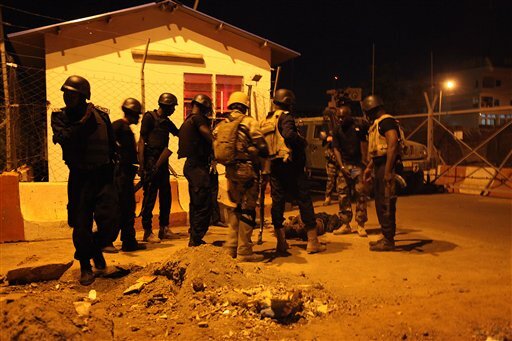 Modibo Naman Traore, a spokesman for the Malian special forces, said three other attackers were still being sought. As of late Monday, no group had claimed responsibility. Sgt. Baba Dembele from the anti-terrorism unit in Bamako told an Associated Press reporter at the scene that it was believed some attackers had entered the Hotel Nord-Sud, where the mission is headquartered. The EU training mission later released a statement saying it had come under attack by small arms fire but no personnel had been wounded, and that Malian security forces were securing the area. EU soldiers, the Malian army, national police and other security forces stood outside the hotel. The assault comes about four months after jihadis attacked the Radisson Blu hotel in Mali’s capital, killing 20 people. Al-Qaida in the Islamic Maghreb and al-Mourabitoun claimed responsibility for that attack, saying it was their first joint attack since al-Mourabitoun joined al-Qaida’s North Africa branch in 2015. In January, extremists from the same militant groups attacked a cafe near a hotel popular with foreigners in Burkina Faso’s capital, killing at least 30 people.